Acupuncture for menopause can make this natural part of aging less uncomfortable and more manageable. Menopause is an inevitable part of a woman’s life — unfortunately, it doesn’t just come and go without making waves. It has a variety of symptoms that may have a significant impact on a woman’s life. Though menopause is a natural part of life, that doesn’t mean that you simply have to endure the symptoms until they go away. There are things you can do to lessen the impact of menopause on your life, and one of those things is acupuncture. In the US, the average age of the onset of menopause is 51. Menopause is the natural end of your menstrual cycle; it therefore marks the end of your fertility. Usually, if you’re in your 40s or 50s and haven’t had your period in 12 consecutive months, then you’re likely starting menopause. Menopause comes naturally with age, but there are also other things that can trigger it. It can also cause some health complications, but fortunately, acupuncture for menopause can help you manage many of menopause’s effects. Perhaps the most well-known cause of menopause is age. When a woman is in her late thirties, she begins to produce less and less progesterone and estrogen, which are hormones that regulate menstruation and fertility. A woman in 40s will begin experiencing changes in her menstruation, and by her late 40s or early 50s, her ovaries will stop producing eggs. A total hysterectomy and bilateral oophorectomy, or the total removal of the uterus and both ovaries respectively, can also result in immediate menopause. This will also likely be accompanied by severe menopause symptoms, since the changes are immediate and do not happen over the course of years. Chemotherapy and radiation therapy can also cause temporary menopause. Another cause of menopause is primary ovarian insufficiency, in which a woman experiences menopause before the age of 40. This condition is quite rare, and only affects about 1% of women. Perimenopause refers to the span of time that leads up to menopause, typically lasting months or years. During perimenopause, a woman may begin to experience irregularities in her menstrual cycle. She may also begin to experience changes to her body such as vaginal dryness, weight gain, dry skin, thinning hair, and a reduction in breast fullness. She may also experience things like hot flashes, chills, sleep issues, and mood disturbances. However, that’s not all that may happen. With the onset of menopause also comes an increased risk for many illnesses. Menopause can put a woman at a higher risk of developing osteoporosis, heart disease, and depression. You may also be more prone to urinary incontinence as well as urinary tract infection. Menopause is a big change, and its symptoms and effects can be difficult to handle. There are some lifestyle changes that women can make so these symptoms can be more manageable, but you also have the option of acupuncture to help you. It’s important to remember that acupuncture will not be able to reverse the aging process, nor can acupuncture stop it. However, acupuncture will be able to help you manage symptoms and make them less severe. While acupuncture can be helpful, you should still see a doctor when you’re in perimenopause and actual menopause. Your doctor will be able to help you with preventative screening for various health conditions, and they’ll also be able to help you with any questions you may have about acupuncture. Acupuncture is an integral part of traditional Chinese medicine (TCM). The principles of TCM state that an individual’s well-being is heavily influenced by a life force called qi (pronounced “chee”). When qi flows normally along parts of the body called meridians, it leads to good health. However, when the flow of qi is disrupted, or is concentrated around certain meridians, it can lead to disruptions in physical, mental, and emotional health as well. However, acupuncture can restore the normal flow of qi. Acupuncture entails the use of very fine needles, which a licensed acupuncturist will insert into acupuncture points relevant to the specific symptoms the patient is experiencing. The needles can stimulate these acupuncture points and push qi into its proper flow. While acupuncture is usually low-risk, it can come with some side effects especially if it’s practiced by an unlicensed and inexperienced practitioner. Fortunately, at the Santa Barbara Herb Clinic, you can be sure to receive safe and effective care. Our owner and Licensed Acupuncturist, Tram Pham, has a Master’s Degree in Chinese Medicine from Yo San University. She also has years of experience in treating patients under the guidance of the age-old modalities of TCM. Acupuncture may not be able to help you with each one of the possible symptoms of menopause, but it can help you manage some of the more common symptoms. It can also help you deal with some of the changes that your body may undergo during menopause. Hot flashes are one of the more common hallmarks of menopause. It can be quite uncomfortable, but acupuncture for menopause can help reduce the frequency of hot flashes, as well as their intensity. Acupuncture has also been found to be effective in helping with a slower metabolism, as well as weight gain. However, in terms of weight gain, acupuncture is more effective when done in conjunction with lifestyle changes and a better diet. There is also evidence that acupuncture can induce a better balance in hormones, but more research about this is necessary. 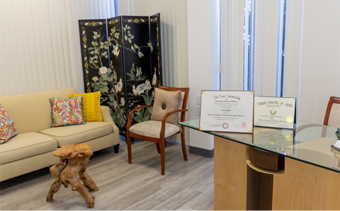 The Santa Barbara Herb Clinic has been providing acupuncture for menopause and other issues since 1986. The clinic was founded by Dr. Jean Yu, and it passed to Tram in 2016. 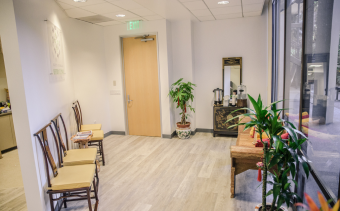 Tram has since continued the clinic’s tradition of providing Santa Barbara with all-natural and holistic healthcare guided by the principles of TCM. To book an appointment or schedule a consultation, you can call us at 805-563-0222 or email us at info@santabarbaraherbclinic.com. You can also have a consultation with Tram over the phone or via video call. Contact us today to begin your journey to better health!